Suren Gazaryan took on the Kremlin in trying to block illegal development at the Sochi Olympics and on the Black Sea coast. Forced to flee to Germany, he can finally get down to researching his beloved bats. Russian zoologist and environmental campaigner, Suren Gazaryan, is today awarded the 2014’s Goldman Environmental Prize winner for Europe. Gazaryan has fought against illegal land grabs which threatens the Russian wilderness. Leaving his family behind, he fled Russia to avoid trumped up charges of murder threats and now lives in exile in Germany and Estonia. 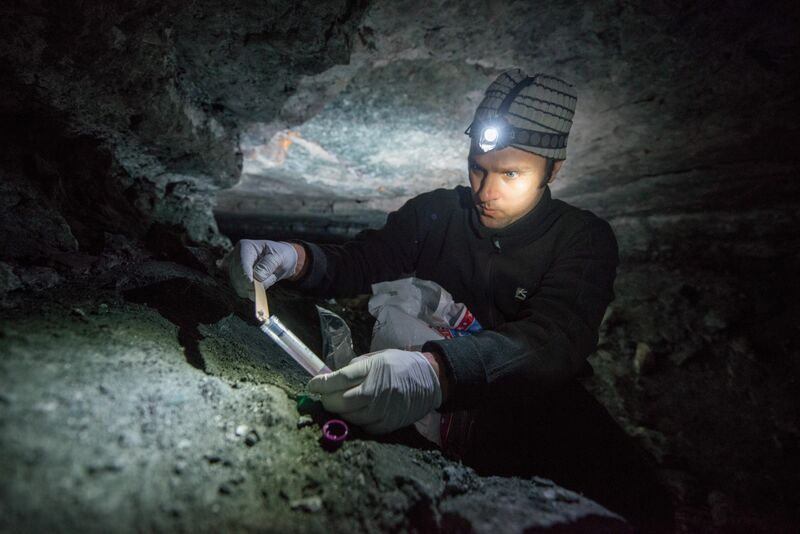 Suren Gazaryan taking soil samples from the walls of a cave where bats are hibernating over the winter. The soil samples will be tested for an infectious diseases that is spreading among bats. The Goldman Prize, the world’s largest prize for grassroots activists, awarded to six people from each of the world’s six continents. It is often awarded to men and women who take great personal risks to safeguard the environment. And Gazaryan certainly fits the profile. His organisation Environmental Watch on North Caucasus’s (EWNC) campaigns against corrupt government land grabs and the destruction of protected areas in the Krasnodar region in the Western Caucasus – the site of the Sochi Winter Olympics – has made him a target for government persecution. In spite of this, Gazaryan successfully reinstated the protected status of the Utrish Reserve and stopped construction work in a protected area. His work also helped establish a legal precedent for protected zones on the shores of the Black Sea, a UNESCO World Heritage Site. His studies also revealed that residences had been illegally constructed along the Black Sea coastline: “It turned out there were a lot of them, and all were associated in some way or another with the government. Gazaryan and his fellow campaigners went to the building site of former president Medvedev’s palace and physically blocked the bulldozers. He explains that after two weeks the builders realised they weren’t going to be able to move forward and the construction ended. They then embarked on a campaign to make the area a nature reserve, in order to protect it from further destruction. After rallies, demonstrations and social media campaigning collecting tens of thousands of signatures, they succeeded, and the federal government finally awarded the Utrish Reserve the highest level of federal protection. Social media was part of the success when reaching out to people and gaining support for the campaign. New media such as VKontakte (a Russian social network), YouTube and blogs have rapidly become an important news source for Russians skeptical about government controlled media. Gazaryan authored hundreds of blog posts under his real name and shared video footage on YouTube that he filmed during his inspections of illegally seized land: brave acts given the current political climate. But in 2012 Gazaryan was forced to flee Russia and seek political asylum in Estonia, leaving his family behind. It was either that or face a long prison sentence, all because of taking great risks while bravely fighting to protect the Russian wilderness. For a winner of what’s been called the Nobel Prize for the environment, he is very modest about his own achievements. And although he says he is “honoured”, he rejects any suggestions of being a hero. Instead he keeps drawing the attention back to the work of his organisation, what more needs doing, and to the fate of his close friend and fellow activist Evgeny Vitishko, who is now imprisoned in a penal colony. Gazaryan and Vitishko were both given three years’ probation in June 2012 for damaging the fence of the property of a government official in the Krasnodar region. Later that year, after another situation at a construction site at Putin’s palace, the Russian authorities charged him with a second criminal case for allegedly threatening to kill security guards, charges Gazaryan has denied. He explains that because he was already on probation, he was then in danger of being imprisoned, hence why he fled the country. His friend, however, did not leave, and after another incident in November 2013, Vitishko’s probation became a custodial sentence. He may be a prize winner today, but Gazaryan says their battle was lost. “I don’t see myself as a hero. Because there is a fine line between hero and victim in my situation. The recently introduced ‘foreign agent’ legislation has placed enormous pressure on Russian environmental activists. The new Russian law targets NGOs which receive overseas funds and are deemed to be politically active, requiring them to register as ‘foreign agents’. Because of this, EWNC has been effectively closed down: bank accounts have been blocked, so they cannot do any official work or pay rent, nor can they receive donations for their work to continue. This also means that he cannot send any of his $175,000 prize money to EWNC. But Gazaryan says he thinks they will carry on “unofficially” despite the challenges. However, he says opportunities will be missed as it will be difficult for the organisation to operate. There was a lot of media attention surrounding the environmental threats posed by the Sochi Olympics this year. Now, says Gazaryan, with the Olympics over the spotlight is gone too. But that doesn’t mean it should be forgotten. Gazaryan says he plans to continue to fight ongoing land grabs in the Krasnodar region. The Winter Olympics were catastrophic for the environment, according to a new report that Gazarayan’s EWNC has managed to gather despite their difficulties. It argues that international complacency has allowed the Russian government to destroy a unique ecosystem and cause widespread environmental destruction not seen since the industrial era over a century ago. water pollution, landslides and erosion. So what else does the future hold for Gazaryan, who has now had to start a new life for himself? For now, he says he will focus on his new job which allows him to further his research on bats. Unless the political climate changes, he is not sure when, or if, he can ever return home. “There are reasons why I left Russia and if the causes for me leaving Russia are still there it will be very difficult, or impossible even, to go back. I don’t think that while Putin is in power it’s at all possible. But change takes time, he explains. “Russia needs a change in political system. This change should come from within the society, so the society should put pressure on the power to change the political system. So how will Gazaryan use his Goldman Prize money? “I think perhaps to buy a house in Germany.” Which sounds very sensible – and is surely a well deserved reward for the many risks and privations he has suffered.